Office Politics - Do you need to play to get ahead? As you've gotten older, you've probably realized the adage "life isn't fair" applies to just about everything - especially corporate environments. Competitive offices are inherently political, and oftentimes highly qualified professionals can't succeed in these workplaces unless they're willing to play the game. According to recent industry research done by ProOpinion, over 55 percent of professionals believe that office politics are present in their places of employment. Over 17 percent of workers believe that if they don't "play the game" at work, they won't be promoted. About 15 percent of people feel as though office politics are a definite issue in their workplaces, while almost 13 percent think that if they don't behave like their colleagues, it will work against them. About 11 percent of workers believe that office politics are a central reason they aren't succeeding at their jobs. While placing yourself above the grind of office politics might make you feel good, it's probably not doing much to bolster your career. Whether or not you like it, you need to jump in the game if you want to make a name for yourself and achieve your professional goals. Here are five things you should do to play the game - and win. You can't propel yourself forward in your career alone - you need the confidence and support of others in your industry to leverage your skills and qualifications. Bloomberg Business explained that the most basic way to gain the trust of your colleagues and superiors is simply to get to know them. You shouldn't be communicating with others looking for weaknesses you can use against them, however. Simply engage people in a positive way and let them know that you have goals, ideas and motivation. They will be more likely to consider you for promotions, raises or other exciting opportunities. "It's all about who you know." If the thought of networking makes you break into a cold sweat, it's time to get over your fear of this tried-and-true career-boosting technique. If you're serious about achieving your professional goals, you need to reach out to people in your workplace and beyond. It really is all about who you know, so creating relationships with as many people as possible gives you an inherent advantage. Don't be afraid to email your managers and ask them to grab some coffee, or message successful industry professionals on social media to pick their brains. Bloomberg noted that fearless networking is great way to secure a mentor in your field. Having someone with firsthand experience to show you the ropes can give you a major advantage when it comes to navigating the often unpredictable landscape of professional politics. The source noted that some people view this technique as "brown-nosing" and choose to keep to themselves to avoid appearing desperate or conniving. Neglecting to forge social connections with fellow employees and company higher-ups won't make you appear diligent and hardworking, however. It usually makes people come off as disinterested and self-conscious. 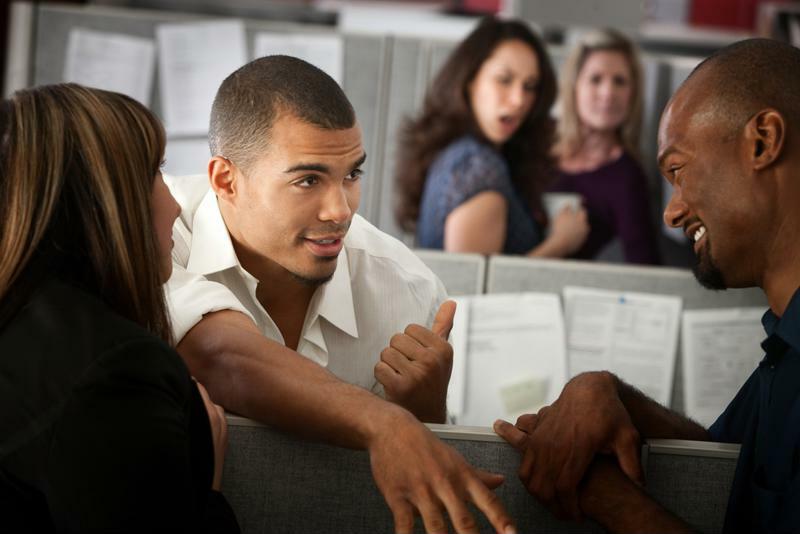 Staying away from office gossip is a major part of beating the game. Drama and politics often go hand in hand, but separating yourself from the gossip can actually boost you to the top of the game. Forbes magazine explained that many people eager to conquer politics use smear campaigns fueled by rumors and scuttlebutt to make themselves look better than their counterparts. However, this method of progress often backfires, making the gossiper appear petty and untrustworthy. The source recommended keeping your lips sealed even when you feel wronged or frustrated. If you have a real concern, always bring it up with your superiors in a polite and professional manner. Venting to other workers might make for a satisfying release in the moment, but it may ultimately tarnish your reputation. So next time you're feeling worked up, go for a walk around the block instead of strolling to the water cooler to air your grievances. Finding your comfort zone at work can take a while, which makes the idea of stepping outside it that much more intimidating. However, staying in your routine won't take you anywhere. In fact, failing to take chances for too long could even pigeonhole you in an entry- or mid-level position for much longer than you'd like. Salary.com explained that workers who don't establish a brand for themselves are usually branded by others. You should strive to have autonomy over how others see you - don't sit back and let your colleagues define you. "Avoid labels and continue to evolve." Bloomberg Business explained that a major part of succeeding in office politics is to avoid labels and to continue evolving at all times. If you've got your eye on a promotion, would like to sit in on a meeting or are interested in taking on a special project, don't be afraid to speak up. Even if you aren't able to conquer that one goal, your higher-ups are definitely taking note of your outstanding initiative. A vital part of playing the game is staying consistent. There's a difference between being creative and taking risks and being downright unreliable, and it's a distinction that could make or break your career. Salary.com explained that you should be viewed as your team's rock - no matter what the issue or task is, your coworkers know that you'll handle it in an organized, professional manner. If you're viewed as an unpredictable firecracker, people will be less likely to trust you with important responsibilities. Forbes added that your morals and values should stay steady as well. It can be tempting to cut corners or throw others under the bus to get ahead, but you'll have better long-term success if you focus on remaining steadfast in your principles and ethics.